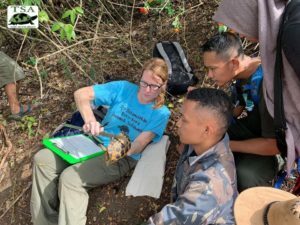 Christine Light (Sulawesi Chelonian Conservation Program Coordinator) and Cris Hagen (TSA’s Turtle Survival Center Director of Animal Management) are currently on Sulawesi Island, Indonesia conducting surveys for endemic chelonians. Their counterparts from Tadulako University (UNTAD) in Central Sulawesi, Dr. Jusri Nilawati and Dr. Fadly Y. Tantu have found Forsten’s Tortoises in the wild before. 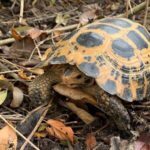 Christine and Cris got to share the excitement of being the first Western Biologists to see a Forsten’s Tortoise in the wild with them, their students, Muh Gunanta Putera and the rest of the team. They are working hand in hand with their local counterparts from Tadulako University, (UNTAD) and counterparts from Bogor Agricultural University (IPB), and Indonesian Institute of Sciences (LIPI) to conserve the Forsten’s Tortoise (Indotestudo forstenii) and Sulawesi Forest Turtle (Leucocephalon yuwonoi). Christine Light, collecting morphometric data. Christine is on her fourth excursion to Sulawesi over the past 3 years and Cris is also on his fourth trip, but over a 17 year time span. Both of them have been in the field searching for (I. forstenii) and (L. yuwonoi) multiple times. While (L. yuwonoi) is relatively easy to find in the right habitat, (I. forstenii) has always eluded them, as well as the small number of other western biologists who have attempted to find the species in the wild. 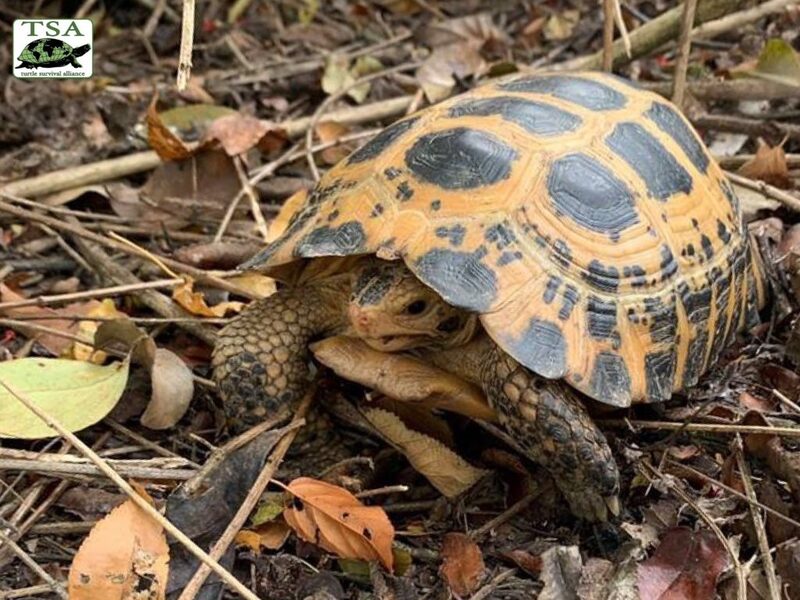 On the morning of 2 February 2019, Christine and Cris had the distinct honor of being the first and only western turtle researchers to encounter (I. forstenii) in the wild. 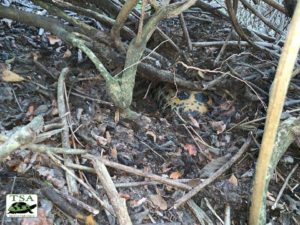 Field data was collected, the tortoise marked for identification, and then released exactly where it was found. Future plans include radio-telemetry and ecology studies for both species. To help continue this important work please donate to the TSA Sulawesi Program! So very proud of my niece Christine & the other researchers! Nice work Christine and team. And we (FADLY Y. TANTU and JUSRI NILAWATI, Researchers from Tadulako University as the Indonesian Counterparts) found the species several times in the wild. And we have significant role in founding this tortoise, we were with them at the time of this finding. The picture above is Christine with our students that also study the endemic Sulawesi tortoise and turtle. This is terrific news! Where there is one, wouldn’t it follow that there must be more?